Bill Ramsey is a 2nd generation dairy farmer from Stark County, Ohio. 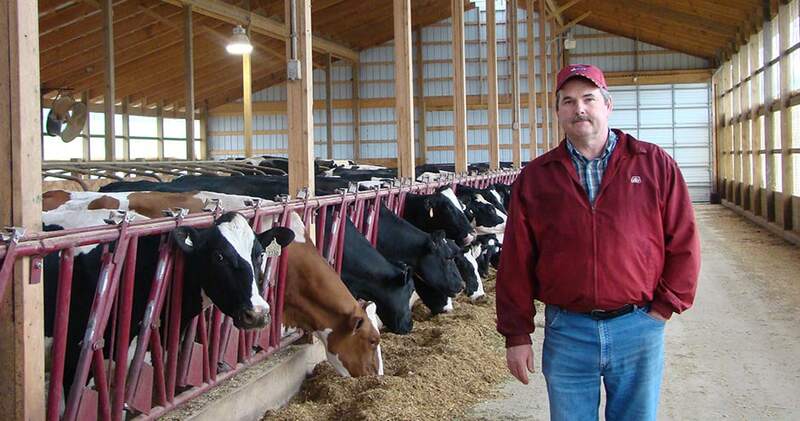 Together with his sons, they care for their 400 Holstein cows and 1,600 acres of crops at Paradise Valley Farms. This multi-generational farm and family has grown through the years, but their commitment to providing top quality care for their cows has remained constant. Bill: I like cows. The farming part of it is neat, especially in the summer and the spring, but I just like cows. I always have. In 1970, along with my parents and my brothers, we purchased our farm. After college, I came back to the farm and I’ve been here ever since. Now my children and my grandchildren are also a part of it. The neat thing about our operation is it’s almost all family. It gives us the opportunity to teach the next generation and keep the farm in the family. That’s what my dad did and I’m hoping to do the same. You give your kids responsibilities as they grow up on the farm and it usually just clicks for them. It’s a privilege to be here and work with my family. I couldn’t ask for a better job. What do you do to care for your cows? Bill: It’s important to know that we work in animal welfare. If our cows aren’t comfortable, happy, well fed and well taken care of, then they’re not going to produce a high quality product, and that is what we need them to do. Sometimes people who aren’t familiar with dairy farming don’t understand how much we care for our animals, but the center of our business really is our cows and their welfare. I love the animals and I appreciate what they do. We help feed the world, and we’re proud of that. What does quality milk mean to you? Bill: We have no problem drinking the milk that’s in our supply, and we’re proud of it. As farmers, we’re paid on quality. It’s best for our business to produce high quality milk. We strive to do a good job and produce quality milk. We help feed the world, and we’re proud of that. New equipment and modern technology help us to produce the highest quality milk. We try to combine that with traditional farming practices that make sense. Our cows still get out on the ground and have the opportunity to graze, and they enjoy that.